Duration: 2.5 hours (can be shortened if need be). Starts and finishes: Sde Boker - 09:00, 12:00 (and 15:00 in summer). We will begin from the view point just beneath Ben Gurion's tomb and then descend the Serpentine Ascent to the Tzin Valley which will lead us to where Wadi Akev joins the Tzin, as we drive up the Akev valley, criss crossing the dry stream bed as we go, we may be lucky enough to see some of the Griffin Vultures or possibly, in summer, the Egyptian Vultures. 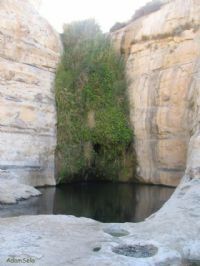 A short walk from the trail head will bring us to the fantastic Akev spring, here those that wish may swim in the deep cool pool nestled beneath the spring. After walking back to the trail head and the jeep we will backtrack to the Tzin Valley and then continue down the valley as far as the historic oil pipe line road that will lead us back to Sde Boker and the end of our trip. Price: 6 seat Landrover Discovery (up to 6 passengers) 850 NIS per jeep or 720 NIS for tourists. 8 seat Landrover Defender (up to 8 passengers) 1,050 NIS per jeep or 890 NIS for tourists.